Cross Creek Farm Canine Water Sports | Cross Creek Farm Canine Water Sports breaking news. Join the exciting dock dog jumping water sports! Cross Creek Farm Canine Water Sports LLC is nestled on a secluded 54 acre farm in rural Clermont County Ohio, 30 minutes southeast of downtown Cincinnati. 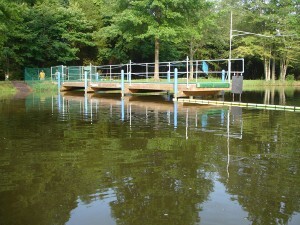 Our competition size dock (8’X40’) is located on a 1 1/4 acre pond. The dock is fenced for safety, covered in Astroturf for comfort, and fully equipped to handle all aspects of dock diving (distance, speed, and height). Next to our shaded pond area is a beautiful grassy flat field where Cross Creek Farm holds UpDog competitions, seminars, and training days for field work. As a paying guest you will have access to an abundance of nature trails that wind thru our woods, fields and creek. Ken and Linda Macke, owners/instructors of Cross Creek Farm Canine Water Sports LLC are experienced handlers and active in the sport of dock diving. Both are able to train you and your canine companion in the proper techniques for dock diving in a safe and enjoyable approach. What a glorious weekend! An absolutely gorgeous site and the people were so welcoming to a newcomer. It would be hard to say whether my dog, or I had more fun.